Calling all trainers to pause Poké hunting and come join in the upcoming Pokémon Run SG. 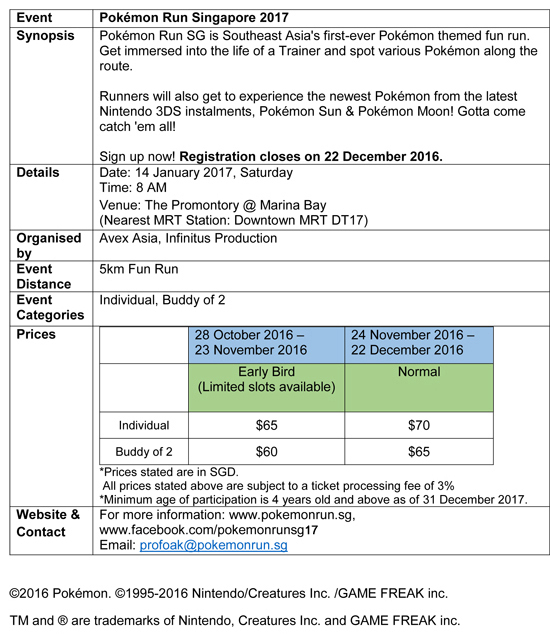 Happening on 14 January 2017 at the Promontory @ Marina Bay, Pokémon and themed run lovers will get the chance to discover classic and latest Pokémon. Singapore will play host to Southeast Asia’s first official Pokémon themed fun run that's organised by Avex Asia and Infinitus Productions. 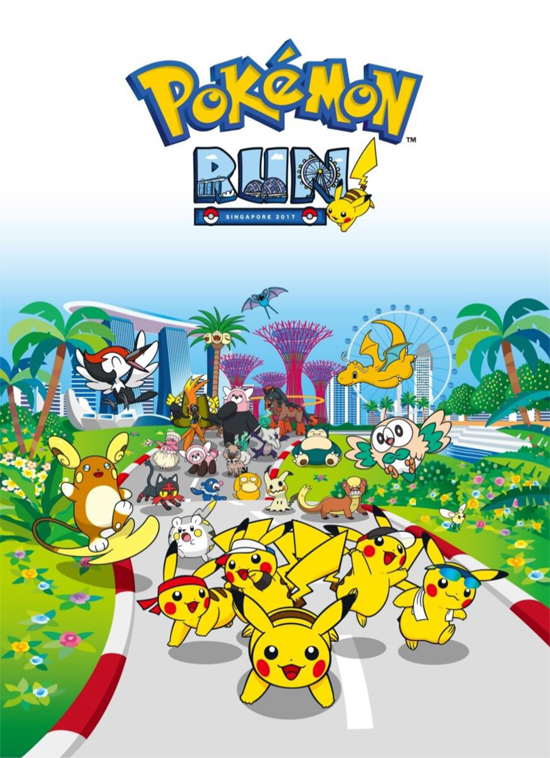 Pokémon Run Singapore 2017 (Pokémon Run SG) aims to promote bonding and a healthier lifestyle across all ages through Pokémon. Open to all participants aged 4 and above, runners can register, individually or in a pair, as they step into the “running” shoes of the aspiring trainer and embark on the adventure to find their first Pokémon. Pokémon Run SG will bring to life the journey to train to be a Pokémon Master, against the backdrop of Singapore’s waterfront cityscape. Including a carnival site - Pallet Town, at the end of the run. It will feature a variety of fun activities including Pokémon-themed games and gourmet delights for participants to enjoy. There are two categories for registration: Individuals (S$70 per pax) and Buddy of 2 (S$65 per pax). Race entitlement packs include an official event T-shirt, among other exclusive items only available at the run. Early bird discounts are available for registration from 28 October 2016 to 23 November 2016. For more information on the pricing for the run, please refer below. For registration, more race information and updates check out www.pokemonrun.sg and www.facebook.com/pokemonrunsg17 . 4 Out Of 5 Popcorns for Inferno ! A Borderless Sunday Brunch Worth Remembering For!